Over half of UK frontline medical staff worry their hospitals won't be able to keep patients safe this winter, according to an "alarming" new survey. The poll, by the Royal College of Physicians (RCP), found almost six in 10 (58%) workers feel "worried" or "very worried" about their hospital delivering safe care during the coming winter. Of the 1,761 doctors, consultants and specialists polled, fewer than one in five said they are "confident" or "very confident" about preparations for the increased winter pressures on the NHS. Shadow health secretary Jonathan Ashworth branded the findings "alarming" and said ministers must ensure there is proper cash available to meet winter pressures. He said: "This is an alarming poll of doctors on the frontline and indicates the health secretary must do more to prepare the NHS this winter. 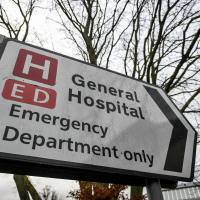 "There was no extra cash for acute trusts in the recent budget for winter and we know many hospitals are facing intense pressures following this year's 'summer crisis'. "It would be unforgivable if patients suffer another winter like last year. Ministers urgently need to reassure us they have a plan and will make proper funds available." The poll also found less than a third of doctors had been asked to take part in planning for winter and 96% did not know how extra cash promised for social care will be used to relieve pressure on their hospitals. Health Secretary Matt Hancock announced last month an extra £240 million will be injected into adult social care services to help get patients home quicker and free up vital hospital beds. The poll of foundation doctors, trainees, consultants, and speciality and associate specialist (SAS) doctors was carried out by RCP in November. RCP president Professor Andrew Goddard said that while more was being done to prepare for winter, the poll showed this was not filtering down to frontline staff. He added: "We know the Government and NHS are doing much more to plan for winter than they were prior to 2017-18. But these findings show it is still not filtering down to staff on the wards, who need to feel confident that plans are in place to deal with the inevitable increase in demand, so they can get on with the job of providing direct clinical care. "When we're concerned that the wheels could fall off any moment, the pressure goes up and morale goes down." If you're looking to escape the winter blues in the UK this year, check out our dedicated longstay travel insurance and find the right cover for you.